I have a very intimate relationship with the missionary enterprise. I am a missionary convert, I became a missionary, and I now work at a school for missionary children. Missionaries are beautiful people who endeavor to bring Christianity to foreign lands. It is an exciting thing to live at the intersection of missionary activity because one does not spout systematic theology with those unfamiliar with the gospel -- you always start at the beginning: God loves you and wants to have a relationship with you. Simple. Pure. Compelling. Missionaries do not coerce people at gunpoint to convert to Christianity. (Well, they used to, but we know better now.) We try our best to live out the beauty of the gospel so as to woo people into a relationship with God. It is an invitation, never a demand. They do, however, teach you at missions control center that at some point you have to start introducing the concept of commitment -- to God, to the church, and to the rest of the world. First, it's God loves you, and next thing you know it's the Cost of Discipleship. It's all fun and games until anti-Nazi dissidents show up. I think western missionaries may have a blind spot when it comes to communicating love. In western culture and certainly in the English language, the word 'love' has been diluted into mere affection, a fleeting emotion. Therefore, western missionaries find it is necessary to reinforce that a Love relationship with God is covenantal and requires a commitment. In many cultures, love cannot be separated from commitment, and sacrifice is implicit in any meaningful relationship. Loving commitment looks very different from toxic control. The very moment one party crosses the line from eliciting covenantal love to demanding entitled obedience, the relationship is in jeopardy. I write in A Love Worth Celebrating, that love can only be authentic when there exists a real possibility of losing it. And in this broken world with imperfect people, we do often lose our greatest loves. Wives walk away from husbands. Children turn their backs on parents. Faithful members exit the doors of church. We lose love because we don't know how to wait patiently for reciprocity. We want to control the other -- make them do what we know is best for them. And as we feel the relationship slipping between our fingers, we tighten our control grip and spiral further down the vicious cycle. "Do you love me?" If you love me, feed my sheep. If you love me, you may face trials. If you love me, give your life. 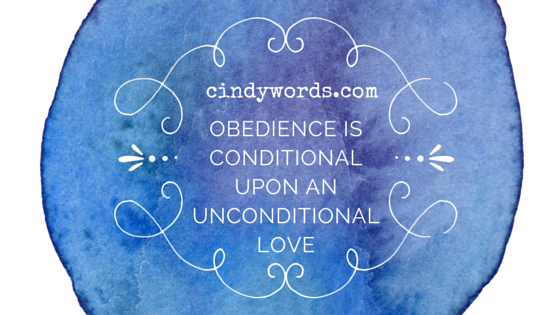 Obedience is conditional upon an unconditional love. This is the nature of the gracious call I received at the beginning of my faith journey. It is radical that God would ask of me, a puny human being, to love God back. It is breathtaking to be given autonomy by a God who gave God's power away so completely on a cross. But how the Body of Christ has forgotten Christianity 101 when we turn around and exert dominance and control over others. When we build hierarchy and demand submission to church authorities. When we silence dissent and cover up abuse and turn our eyes from the suffering of victims. When we deal out harsh punishments in the name of meting consequences, as if we are little gods with our little judge hammers believing we are righteous all while destroying lives. Just as our relationship with God is a delicate dance of reciprocal, covenantal love, so too is any relationship between members of the church and with the church. We can desire wholeness for others. We can believe strongly what wholeness means for members of a community. But we cannot impose behavior modifications on autonomous human beings -- this violates covenantal love. Love does not dominate. Love is not a bully. Love will not hoard power, but gives it away. Cindy blogs at cindywords.com. You can subscribe to her newsletter and receive her FREE e-book, Outside In: Ten Christian Voices We Can't Ignore.